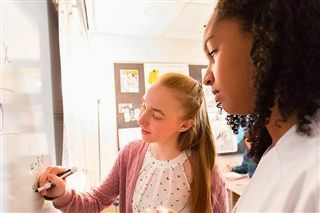 With a class size average of eight students and twice-daily advising sessions, Upper School students work closely with their teachers to find their own paths to success. The St. Andrew’s Upper School provides an essential education designed to prepare our students for best fit colleges. The curriculum builds from a foundation in the ninth grade and leads to more advanced courses, including Advanced Placement (AP) courses. We believe that learning is a process and guide our students to develop the skills that will lead to thoughtful and effective problem-solving in every subject area. Our faculty recognize that each student approaches material in a multitude of ways and at a varied pace. To ensure all of our students achieve the magical click of comprehension, faculty is available for additional support twice a week during the school day and more often on an informal basis during the entire week and weekend. At St. Andrew’s, our faculty are always more than willing to help students achieve their goals. In addition to academics, an active engagement and participation in community life is fundamental to a St. Andrew’s education. From our morning meetings, where the entire school assembles three times per week, to our community service program, our students are taught the power of community and giving back. Community is paramount at St. Andrew’s and a visit to our campus will show why our students feel like they are part of a family and why St. Andrew’s has made a difference in their education and their lives.